Beautiful and vibrant colors. Cozy and cool for all seasons. Add a touch of fresh style to your bedroom with the Laura Ashley Lidia Cotton 3-piece Reversible Quilt Set. This set features a soft, 100-percent cotton construction with a floral pattern in pink with a solid color reverse. This quilt has very vibrant colors! I am very pleased with my purchase. I ordered the king size for my queen bed so it would fit better. I thought the reverse side was going to be solid pink but it is a pink and white print. I was still happy with it. I've had several compliments on the quilt set. I love it!!! this quilt is NOT 100% cotton. it is 30% polyester and 10% unknown fibers. as somebody that is allergic to everything but cotton I'm really angry that this was misrepresented. not sure if I will shop here again. will be asking for 100% refund. I love this quilt. When it arrived the package was open and it didn't look as beautiful as on the website. Then I put it on the bed. Magic. Absolutely beautiful. The shams are really big, so I will need to get huge pillows to fit in them. The only issue is this quilt runs small. I got a king for a queen size bed and it fits nicely but I would like it to hang a little longer. I have a very high bed so going one size up would work for most people. Don't hesitate. This quilt is perfection. 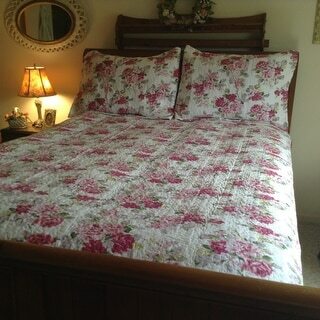 I love my Laura Ashley Lidia Cotton - 3 piece Reversible Quilt Set, completes the rose pink soft touch to my bedroom. The comforter colors are vibrant. Love the colors, and the fact that it is all cotton for cool sleeping. If I had to order it again, I'd order a King size to drape more over the bed. The color and quality are perfect. Based on a review I read I ordered the King for my Queen size bed. 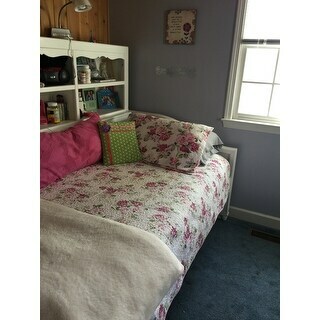 My bed is high and it falls about 10 inches from the floor. I will need to purchase king size pillows for the large king shams. I am very pleased with this purchase and how pretty it makes my bed. Love the colors on this quilt set. It goes very well with a dark cherry wood bedroom set. I have a queen size bed but I ordered a king size quilt because I have a 3 inch mattress topper that I put on top of my mattress so the height of my bed is higher than normal. The king size quilt was a perfect fit. With a white bed skirt, it looks great! Although I love the size, colors and it looks just like the pictures, it is not 100% cotton and all new materials as advertised. The tag says, 100% cotton filling 60% cotton 30% polyester 10% new reclaimed fibers. Maybe I don't understand industry terms, but it seems to me this is not 100% cotton and "reclaimed" sounds like something in it is not new. Would have given 5 stars if it was in fact 100% cotton. I don't purchase polyester bedding in any percentage. I did wonder why it was such a good price. Not what I expected for a Laura Ashley product. Guess things have changed. Disappointed. I pondered purchasing this quilt for some time and looked at many others. I kept comming back to this one and I couldn't be happier I settled on this one. Not only do I love the Laura Ashley brand, I love the bright cheerful ambiance this beautiful quilt brings to my room. Overstock also has the best prices I found anywhere. It is just the right cotton with some polyester to keep shape, color. It is prewashed, so One will not have problems with shrinkage. I already bought the queen, meant to buy King. Wish it had bed skirt/dust ruffle, as the day bed has. I love this print so much, I may buy a 3rd to use the textile for creating upholstery on a treasured mahoghany chair. Or a matching tiny poster bed for my Dog. A tiny chihuahua. Coming from design background Im very picky. Only regret, is Laura Ashley should be made in the USA. Plenty of designers here. Garment makers, or have ethical fair trade practices. This replaced a 200 year old handmade quilt that was worthy of being a museum piece. It was stolen, with much more. I wanted something cheerful, youthful and timeless. It can be shabby chic, or mixed in with very elegant antiques. Florals have been “in Vogue” 2017-2019. That perhaps reminded me of Laura Ashley displays in Michigan as a child. The florals were always so beautiful. Regardless, this trancends “trends”. Ive washed my first one 50 times. Just gets softer, print lightly faded. No loose threads in quilting or otherwise. I obviously did not write this much for $1 reward, but I commend Overstock, plus Ebates. Together Im able to save more, in replacing very sentimental items, that were one of a kind. Perhaps this is why a part of me wants make sure I have an extra set. Its very feminine, and uplifting. I look foreward after putting up Valance, Curtains, to add photos. Bleessings to All. This item is NOT 100% cotton. The pattern is very noce and the workmanship is great. Just don't expect all cotton. I can't say enough about this gorgeous quilt! It's been over 3 years now since I bought it and it still washes up and looks just as beautiful as the day I received it! It has faded a tad, but since it was purchased for my daughter's room, it has been through the laundry at least a hundred times!! All stitching has remained in place and the sham has washed up beautifully without fail as well! Sometimes bedding can have loose stitches or threads after they've been washed, but I've never had any problem with this gorgeous quilt! This is a great quality product which looks just like its picture. I love it just as much as the day it arrived!! I am very please with my purchase. I search several stores and online sights. I wad unable to find a better choice or quality of cloth material. Many of the selections had a modern or comtempary look. I wad looking for a traditional or modest look with a royal flair. Most of the quilt prints looked as if they painted with large brush strokes as compared to the detailed prints that appeared to be realistic and naturally beautiful. The texture of the quilt is of high quality which makes it soft warm and cozy. I would definitely recommend it to others. Met all of my expectations, beautiful, comfortable and well made. Beautiful quilt, excellent quality. I have washed a few times already and it held up nicely. This quilt set is gorgeous. It's a great weight if you live in the South like I do. Fits in great with my cottage style. As a past manager of a Laura Ashley store in the US, I just adore their prints and my home is filled with them. I took one star off as after washing the blanket, the trim near the label came apart and I will have to resew that. I love it! Bright colors. Easy to fold when not in use. Looks clean and fresh. This quilt is one of my favorites! The colors are so pretty and vibrant, and the quality is really nice. It does run a bit small so I recommend going up a size for better coverage. I love the pattern, the material and how it holds up through washings. Not too heavy in Summer and perfect in the Fall and Winter months too here in Florida. COLORS ARE GREAT, LOOKS GREAT IN MY GRANDDAUGHTERS ROOM. AND THEY LOVE IT TO. Super sweet looking. I love that everything I bought matches and that I could order on line in my home. "Does this quilt have red red in it? I was hoping its on the pink red side?" There are some vivid pinks, but even the darker shades are shades of pink. No red. I wouldn't say it's red, the darker roses are more of a dark mauve mixed with sever other different shades of pinks...it's absolutely gorgeous..! I love the contrast of these colors and the fact that the background is white, not cream, not beige, but white, which really makes the roses on this quilt stand out.....very, very pretty! Also, it's very comfy and just right as far as not too heavy that it's too warm, but not flimsy either. I bought a set of pink chiffon sheets to match one of the shades of pink rose and it really set it off even more. I hope this helps. Laurie S.
"Could you assist with King size measurements?" The King size measures 104 inches wide x 96 inches long. The queen quilt measures approximately 90 inches wide x 90 inches long. The king size over is large eough to use as a bedspread on a queen-size bed so long as you use a bed skirt. "What is the thread count on this Laura Ashley 100% Cotton Quilt?" "Is the background color of this quilt white or ivory/cream?" The background is white. It's a very pretty quilt - I've bought 2 (dogs chewed the first one). It is white. It is a beautiful quilt. I'm pleased with this purchase. "Does this quilt and shams shrink when machine washed and dried?" I bought the King size set, washed and dried it in the dryer and I did not notice any shrinkage! "Can I order another pillow sham, if I order the twin size quilt & 1 sham?" Sorry. No extra options with this set. One standard sham with twin size coverlet and 2 with full, queen and king. I found Euro shams but no twin. Thank you, Troy A. and Linda A.